It's Flavour Fortnight in Dumfries & Galloway from 3rd - 18th September. I'm hoping to get to a few events although I'll only be able to do so at the weekends. 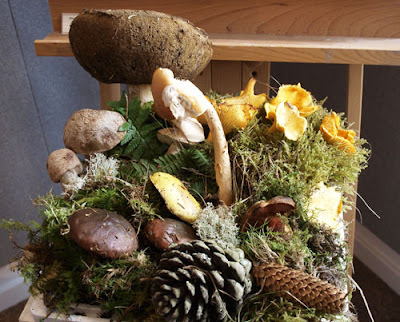 The first thing that caught my eye was the Fungi Foray run by Galloway Wild Foods, it's on next Sunday 11th September. But when I looked closer it is quite far from home (Dumfries & Galloway is about 100 miles end to end), so instead I decided to go for the 'Art of Fungi' event today in Dumfries. 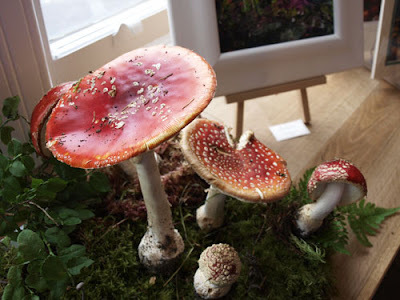 The Art of Fungi is a unique collaboration between Galloway Wild Foods, Devorgilla Gallery and leading Scottish and Dumfries & Galloway based artists. The paintings, prints and sculptures are inspired by mushrooms but there was also a talk by Mark Williams of Galloway Wild Foods. Mark was an entertaining speaker and told us about the mushrooms that could be found in the fields and woods in Scotland. He also cooked some chanterelle mushrooms in butter, added some sea beet (an ancient type of spinach found by the sea) and creme fraiche and served it to us on vol au vents. He also cooked boiled the hallucinogenic Fly Agaric in water for 15 minutes, drained out the water and was able to eat the cooked mushroom without ill effect. It was an excellent introduction to foraging and whetted my apeptite for more. That sounds really interesting Janice. Sounds scary eating the fly agaric though! I wonder who was brave enough to try it the first time?! Those mushrooms in the second photo look like something fairies would sit on Janice tee hee. Does sound interesting though. What a fantastic idea and such clever people to have the time and patience to create such masterpieces too. Sounds really interesting Janice ~ here in France if you find any mushrooms, you can take them to a chemist to see if they are okay to eat or not! I LOVE the fairy ring mushrooms in the second photo. Wow! Really original. Nice way to combine food and art. I love the fact that he introduces sea beet to the recipe too. A great discovery! This sounds great - mushrooms are so hard to identify so I'm looking to go on a guided foraging walk to learn more. Sounds great and interesting im thinking about doing a foraging day close to me in october time! Who knew there's so much variety out there! That sounds like a good thing to do. I prefer to eat mushrooms, but these are pretty amazing. I would always be to nervous to pick mushrooms out in the wild without an expert. I was the Galloway Wild Foods nutter who ate the fly agaric and enthused about wild mushrooms! Thanks for blogging about the day, and I hope you can make one of my proper forages soon. If anyone would like to read more about the background to the exhibition and other foraging stuff I get up to, there is a blog at http://www.gallowaywildfoods.com/?page_id=497. Rachel from Devorgilla gallery will also be writing a blog with pictures from the exhibition soon. I hope you can make one of my proper outdoor forays one day. As a creative foodie, i'm sure you will be hooked pretty quick!